Appalachian Trail north of Bull’s Bridge, Connecticut. I hiked Schaghticoke Ridge again from Rt. 341 in Kent south to Bull’s Bridge and again didn’t find a lot to shoot (or just didn’t feel like shooting). While on a water break near the end of the hike I looked up and found that I was in a small grove of beech trees. I attempted some shots looking up at their smooth trunks but they didn’t work out. Small groups of leaves overhead were making interesting patterns as light passed through their overlapping layers and I took a few pictures as place markers as this type of shot needs more experimentation. This is the high contrast black and white JPEG almost straight out of the Ricoh GR with the added grain. 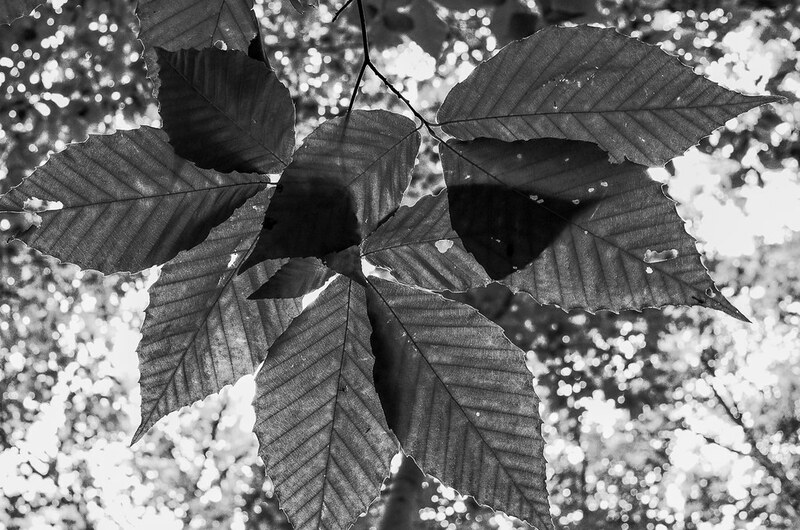 This in-camera processing gives small bits of contrast like the leaf veins a bit more contrast, which I like. I’m not a serious athlete (any more) but doing long hikes in the heat and humidity of summer can dehydrate anyone. Bottom line: it really works. It’s a gel-cap that’s got sodium and potassium and a few other things in it but it’s not Gatorade (ugh) and it doesn’t need to be mixed with water, just swallowed. I took one each hour on the hike with plenty of water and there is no doubt that I felt better throughout the hike and afterwards. Less heavy legs, no cramps and I had more left at the end. If this is something you might be interested in, look up “Salt Stick” on Amazon. Nice HC B&W! Not so rough looks as it many times produces. Jonne: I used to shy away from this processing but I really do like it. It’s used a lot in “raw” street photography but I like it for nature too. Very fine Richard, love the vintage look and feel of it. Thanks Gary. Not sure how vintage this process is, seems very modern/street to me.